Despite medical recommendations to the contrary, we don’t eat a lot of fish. Angela doesn’t particularly like it (but she does like sushi, go figure) and, because we never have it, I’m not particularly good at cooking it. It’s particularly sad as there’s an excellent fish merchant at our local farmers’ market (there’s almost a line of at least 10 people). Tuna is about the only cooked fish that she will eat so every once in awhile I’ll buy some frozen tuna steaks. I buy the frozen ones as I don’t have the confidence level to justify the purchase of fresh. There have been some rather horrifying results in the past. I tried to sear tuna but it ended up cooked on the outside and cold on the inside (and that’s why you allow it to come up to room temperature before cooking it). A “blackened” tuna recipe that used a rub that was so spicy it had to be scraped off the tuna to make it edible (I made that recipe for my at-the-time-future in-laws). So I’ve taken to being much more cautious about fish. I need recipes that are simple and not particularly exotic. So it would seem to be counterintuitive for me to make a Turkish tuna recipe. And, while according to the cookbook, it’s a traditional Turkish recipe (and we know how well that worked out for me before), it really could be Greek or Italian or Californian. I liked the lemon and olive oil flavor from the dressing. Angela did not. I did remember to remove the tuna from the refrigerator in advance so the middle was warm but, unfortunately, I overcooked the tuna. I didn’t make sure the skillet was adequately hot before adding the tuna so it took longer to sear. But, it was still good. In fact, I may splurge on some fresh tuna and make this again. 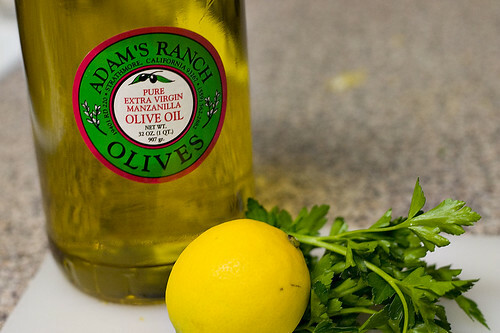 Mix together the lemon juice, 2 tbsp olive oil, the Italian parsley to form the dressing. Season it with salt and pepper. Set aside. 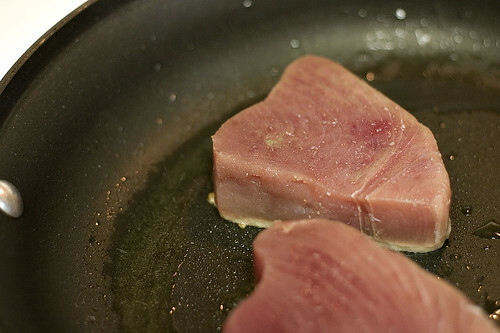 Remove the tuna steaks from the refrigerator at least 1/2 hour before cooking. Dry the tuna steaks on paper towels thoroughly. 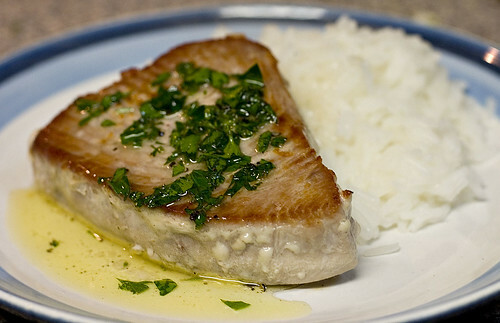 Season the tuna steaks with salt on both sides. Brush the remaining 1 tbsp of olive oil on both sides of the tuna steaks. Heat a heavy skillet over high heat until hot. Sear the tuna steaks for about 1 minute per side. Serve the tuna steaks with the dressing.